Plants add beauty and freshness to indoor and outdoor spaces. That’s a fact. However, there’s so much more to plants than just the outer beauty. If you look a little deeper, you will discover the benefits of interior design with plants is so much more than just creating an aesthetically pleasing arrangement. 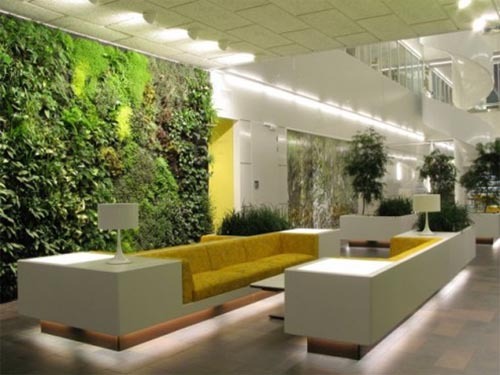 Adding indoor plants to offices, as well as the home, decrease the feelings of being trapped. Let’s take a deeper look into the top benefits of interior plant decoration. Being close to greenery makes us feel more at ease, and we experience less stress when there are plants around us. Whenever you think of a tranquil environment you probably picture yourself in a Zen-like setting with lush green plants all around and trickling waterfalls quietly soothing and relaxing you all the way through. Statistics show that workers are more productive in offices with interior landscaping and hospital patients benefit greatly from rooms full of plants and flowers. There is also evidence that shows students performing better in green environments. The green color of plants relaxes the mind and puts the body at ease. Many offices have reported a decrease in employees taking sick days and an increase in productivity when there is interior landscaping. Minor health issues like headaches and fatigue are also reduced in the presence of lush green plants. One of the most well known benefits of interior plant decoration is that of improved air quality. Plants are known for absorbing carbon dioxide and releasing it back into the environment as oxygen, which is a huge benefit for people. Some plants also absorb harmful chemicals and toxins, which helps clean the air we breathe. The mere presence of indoor plants creates a feeling of clean refreshment. The Sansevieria plant, or Snake plant, is also know for absorbing carbon dioxide and turning into oxygen at night (most plants do this during the day), which makes it a beneficial plant for bedrooms. Indoor plants can also help increase humidity, reduce dust levels, reduce certain pollutants and keep air temperatures low. Owning and taking care of plants helps improve emotional health. It helps you feel needed and you won’t feel alone. Combine this to the already bountiful benefits of stress management and you’ve got yourself a recipe for an increase in overall well-being. Adding a few indoor plants to your space will help you relieve tension, reduce stress, feel calm and feel happy. Research shows that plants can help reduce noise from busy roads and more recently, interior plants have also been shown to reduce background noise levels indoors. Plants and their leaves absorb and reflect noise, which in turn makes the environment more comfortable to visitors, residents or workers. Adding plants to your space is an easy way to help filter and absorb excess noises in order to provide a more calm and tranquil environment to others. Simply put, plants are pretty and most people add plants to their dÃ©cor for the visual appeal. This goes beyond the fresh bouquet of fresh flowers that only last a week or two in a vase on your dining room table. Small and large trees, succulents, ferns and various other plants can boost the aesthetics of your home. These decorative plants add color, ambiance, personality and life to a bland space. Regardless of what the motivation is behind the interest in interior plant decoration, it’s hard to deny the multiple added benefits that accompany plants. Besides the improved Zen-like environment and the aesthetic appeal, plants help reduce stress and tension, they can reduce background noise, they create a tranquil environment, greatly improve air quality and they can improve the overall mental health and well-being of a person. Who would have thought that a small plant that sits in a corner could accomplish so much? Interior Gardens specializes in interior and exterior plant and flower design for residential, commercial and hospitality spaces. Our expert team provides a full assessment of your space and creates customized recommendations based on the needs of your home or business. Interior Gardens also offers support, health and maintenance of your plants and flowers so you can ensure they are always healthy, happy and effective. If you have any questions about the benefits of interior plant decoration please contact our team at Interior Gardens today for assistance.